WEST LONG BRANCH, N.J. – Canisius sophomore Isaiah Reese scored a game-high 26 points to go with four rebounds, four assists and six steals and senior Jermaine Crumpton added 15 points, four boards, two assists and two steals as the Golden Griffins went on the road and defeated Monmouth 78-60 Friday night in OceanFirst Bank Center. The win, Canisius’ sixth straight, moves the Blue and Gold to 19-9 overall and 13-2 in MAAC play, while the Hawks slipped to 9-18 overall and 5-10 in league action with the loss. The win sets up a first-place showdown for Canisius at Rider on Sunday afternoon in Lawrenceville, N.J. Both teams will enter Sunday’s game with identical 13-2 league marks. Reese scored his 26 points on 10-for-18 shooting, with four of those makes coming from behind the 3-point arc. He scored 19 of his 26 points in the second half, and he matched a career-high with his six steals. Freshman Takal Molson added 10 points, while junior Jonathan Sanks came off the bench to chip in eight points on the power of two makes from long-range. Sophomore Malik Johnson scored five points, dished out a game-high seven assists and recorded a career-best five steals in the win for Canisius, as the Griffs who on Monmouth’s home court for the first time in program history. The Griffs used a 17-5 run over the final 7:22 of the first half to turn a 25-22 Monmouth lead into a 39-30 advantage at the intermission. In that run, Molson scored five points, Crumpton posted four points and senior Selvedin Planincic hit a 3-pointer from the top of the key. Planincic ended the night with seven points, five boards and two assists as the Griffs shot 50 percent from the field, 37.9 percent from 3-point land and 70 percent from the free-throw line for the contest. In the opening moments of the second half, three different Canisius players scored buckets to push the Blue and Gold’s cushion to 45-32 with 17:32left in the game. Monmouth was able to get within 11 points with 13:23 left to play, but eight-straight points by Canisius, with back-to-back lay-ups by Reese, stretched the Griffs’ hold to 19 points at 60-41 with 10:47 remaining. Monmouth freshman Deion Hammond scored 14 points in the loss for the Hawks, while Louie Pillari came off the bench to add 14 points as well. The Hawks shot 46.9 percent from the field, 33.3 percent from 3-point land and 72.7 percent from the free-throw line in the loss, but Monmouth turned the ball over 21 times, which Canisius turned into 18 points. • This was the 11th all-time meeting between the two programs, and Monmouth now leads the series 7-4. • This marks the first time Canisius has swept Monmouth during the regular season. The two teams started the series in 2013-14. • As a team, Canisius was credited with 14 steals, the most for the team this season. • Reese’s 26 points on Friday is his ninth game with 20-or more points scored this season. • Reese now has at least one steal in 19-straight games. 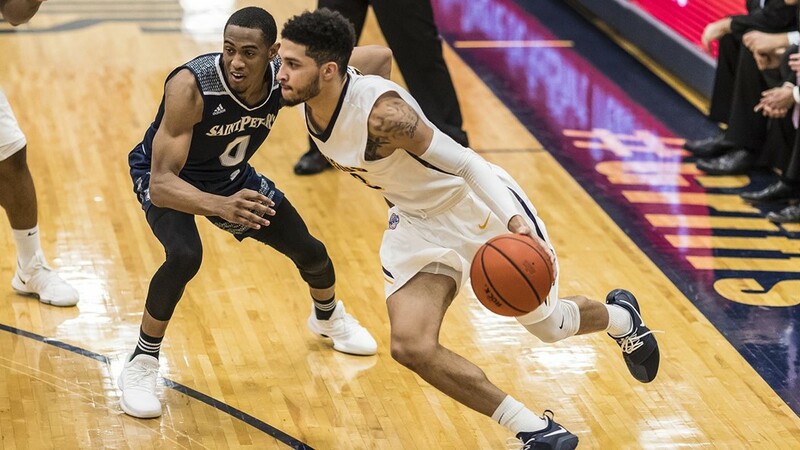 His 66 total steals this season are the most for a Canisius player since Frank Turner had 66 steals in 2009-10. • Crumpton’s 15 points gives him double-figures in the scoring column in 24 straight games, and moves him within four points of becoming the eighth player in school history to reach 1,500 points for his career. • The seven assists for Johnson gives him five-or more assists in 30 games. • After going the first 25 games of the season without a block, Johnson now has a blocked shot in each of the team’s last three contests. Canisius will continue its three-game road trip in New Jersey on Sunday when the Griffs play at Rider in Lawrenceville, N.J. Game time is set for 2 p.m., and the game will be broadcast live on MAAC.TV. The radio call will be available on Buffalo’s WECK 1230-AM and 102.9-FM, GoGriffs.com and the TUNEIN app.